Entering labor hours and material purchases in Work Order allows you to track the cost of a work order. These transactions open up reporting doors to help you see where resources have been allocated. On the work order form, scroll down to the Transactions sections and click on New Purchase Transaction. Trns Date will automatically populate with today's date. This date can be backdated to reflect the date of the actual purchase. Choose the Supplier from the drop down list/binocular lookup. If the Supplier is not in the list, create a new one by typing the Supplier name in the field. *Once the transaction is saved, the new Supplier will be added to the list. Select the Budget Code associated with this transaction. In the Purchased by field, choose the name of the employee responsible for purchasing the material(s). In the Cost Each field, enter the cost per unit and enter any Markups or Discounts. *If the quantity is 1, the Cost Each entered will be the total cost. Add any additional Sales Tax, Shipping/Freight, or Other Charges. The Amount will automatically calculate based on the Quantity, Cost Each (Markup/Discount), Sales Tax, Shipping/Freight, and Other Charges. If the work order has been completed, you can change the status to Complete by checking the Complete Work Order box. 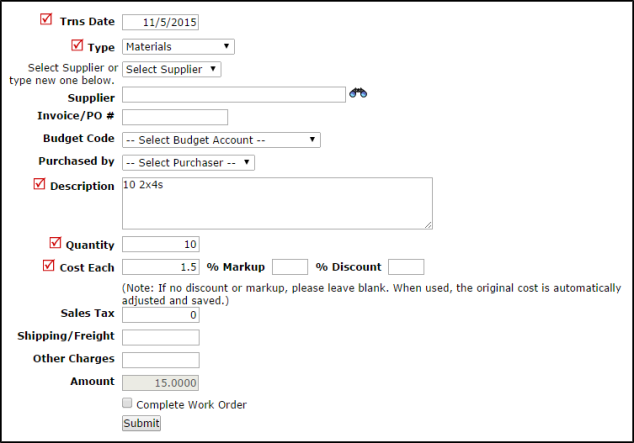 To edit or delete a Purchase Transaction, click on the item description in the Item Number Description field from the Transactions section of the work order. The purchase entry page will load so you can edit the information. Click the Submit button to save the changes.